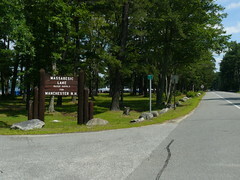 Youngsville is a neighborhood on the eastern edge of Manchester in what is often called the Massabesic Lake District. Youngsville is bordered by Route 101 to the north, Lake Massabesic and the Auburn town line to the east, Holt Avenue to the south, and Interstate 93 to the west. This neighborhood was named after the Youngs and Proctor families. In 1855, the Youngs deeded land to the City for the construction of a school which served up to 60 students at a time. In 1909, the building was moved to 1565-9 Candia Road and is a private dwelling today.